Between February 2015 to February 2016, the Driver and Vehicle Standards Agency (DVSA) have undertaken trials for the new 2017 practical driving test. Little has changed in the current driving test since the introduction of independent driving in 2010 and with this, the DVSA have set out plans to update the driving test in a way that reflects current driving habits. The DVSA state that this is to increase road safety and reduce the number of traffic accidents, particularly among young drivers. The trials conducted between 850 driving instructors and 4,500 learner drivers is set to become reality for all, in England, Scotland and Wales from Monday 4 December 2017. The driving test price will remain unchanged and though most driving instructors welcome a modern, realistic driving test, many have expressed concern over the reaction to the new test changes. With waiting times already well in excess of 10 weeks at certain test centres, the fear is that learner drivers will be rushing to book their test before the new test procedures are implemented. This will clearly result in much longer test waiting times than those that currently hinder many test centres. Driving instructors request that waiting times are significantly reduced before the new test is introduced. Whether the DVSA can reduce waiting times remains to be seen, though they are employing more examiners and opening new test centres to address the issue. The DVSA are also looking at test centre hours of operation in certain areas to include evening and weekends. 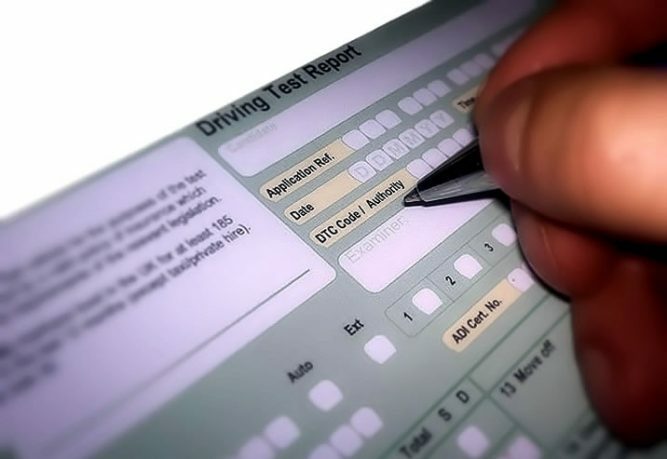 Independent Driving – Currently, this section of the driving test involves reading (whilst stopped) and following (from memory) directions from a basic map and following road signs to a predetermined location. This will continue, along with an extra 10 minutes of following directions given by a sat nav. Following guidance from a sat nav applies to four-in-five tests conducted. Where a sat nav isn’t used, you’ll need to follow traffic signs instead. You cannot use your own sat nav during the test, the examiner will provide the sat nav and set it up and input the route. You’ll be able to ask the examiner for confirmation of where you’re going if you’re not sure. It won’t matter if you go the wrong way unless you make a fault while doing it. Show Me Tell Me – At the start of a practical driving test, examiners ask one ‘show me’ and one ‘tell me’ vehicle safety question. One of these questions will be asked whilst the test candidate is driving. An example could be to show the examiner how you would clean the front windscreen by use of washers and wipers. Motorway Driving – Until now, learner drivers have not been permitted on motorways. Under the new 2017 driving test changes, it has been confirmed that learner drivers will be entitled to take driving lessons on motorways, though this is voluntary. Lessons on a motorway must be taken only with an approved driving instructor (ADI) and in a car fitted with dual controls. However, until the new law comes into effect sometime during 2018, it is still illegal for learner drivers to drive on motorways. The grading system or pass mark for the 2017 driving test will remain unchanged. You’ll fail if you receive 16 or more driving faults or any serious or dangerous faults. Will the Driving Test Changes Work? Night Driving – Distinguishing one road user from another is much harder at night, as is correctly gauging traffic speed. Advanced driving courses such as Pass Plus already cover night driving and motorway driving. These courses are however voluntary and infrequently taken. Black Box Insurance – Otherwise know as telematics insurance to be compulsory for all young drivers. These boxes record a drivers speed, distance traveled, time of day, but more importantly it records driving style such as braking, acceleration and cornering. These types of insurance encourage young driver to use the road safely due to a rise in premium if unsafe driving is detected. The current situation with regards reversing manoeuvres doesn’t include reversing in a ‘real’ car park. Only reverse bay park can be conducted in the test centre car park- however, many test centres like Banbury DTC do NOT request this exercise currently due to the poor reversing facilities. So would the new changes require learners to drive in forward and reverse backwards in ‘real carparks’ or will this exercise be conducted solely in DTC carparks? I agree with the changes; but if I was to part with my opinion on the matter- why detail to the public what changes will be made and depleted? Why not state what will be included; all this does is encourage learners not to practice certain manoeuvres which are still a fundamental part of ‘real life’ driving, and solely focus on ‘how to pass a test’, when the fact of the matter is, not every test centre can accommodate reversing manoeuvres and I’m pretty sure they won’t start performing this exercise in Tesco’s car park- this would cause a right out-roar! That’s a very valid point. In fact, I often find myself reversing round a corner to turn my vehicle around, so it seems rather odd to be replacing this. I agree, perhaps add or alter manoeuvres, but removing those that many drivers use each and every day will, as you say focus learners on passing the test rather than extend their skill set. In terms of manoeuvres, It seems like the DVSA are trying to fix something that isn’t broken and as bay parking is limited to certain test centres only, it will make manoeuvres far more limited than they are now. Hmmm this is the DVSA we are talking about! They want to improve driver education, yet they push for changes like this!!! They don’t want people to use technology such as mobile phones, ipads etc, yet, they are forcing examination with digital items; isn’t being able to navigate on one’s own ability productive to a learner’s learning structure? This merely makes a learner driver lazy behind the wheel, they have less focus on their surroundings, they are encouraged to look down (away from the road) at the SatNav to follow ‘modern day practices! Surely this is just bad practice and setting false examples! Even if they didn’t look at the satnav, they are still listening to a voice directed machine, what is the difference from an examiner doing it before they introduced the independent driving? Learner’s can only really get to grasp with the ‘real world’ once they have established the road experience. Until then, they should be solely focused on road safety and proper conduct of good ole relying on themselves to be able to plan and anticipate their own journey! But, the DVSA has to be seen to be making changes in reflection to modern day life; hmmm, I wonder what the next 10 years of statistics proves? One part of the new test I find alarming, is stopping on the wrong side of the road, then manoeuvring back onto the correct side!! This will cause untold danger up and down the country, as thousands learners practice this every day!! In London, this will be particularly dangerous, as the views and weight of traffic are so bad!! They should be adding monounves not taking them away. I use reversing around a corner everyday. They should also raise the driving age to at least 21 it would get a lot of cars of the road and would help public transport. At the age most people at still studying which means they should get free travel and shouldn’t need a car. There are to many young people on the road. I mean think about it a car is a killing machine and 17 years old children are allowed to get behind the wheel of these killing machines why? They do not have the maturity and awareness to deal with some situations you face on the road. Most accidents are caused by young people or involve them so why not take them out of the equation. I myself started learning to drive at 17 but I quit and started again at 24 and I found I was so much more aware of everything and found it a lot easier to concentrate. I agree with the manoeuvres. I often reverse around a corner when I need to turn a car around as I’m sure many do. It’s not only a perfectly legitimate manoeuvre, but also an excellent test of car control and observation. I see your point on increasing the driving age to 21 years, though in reality public transport in the UK is not in a sufficient state to rely on. In certain areas public transport may not be available at all or may be too unreliable to depend on. And as for trains, well, we can see the state of affairs on how they’re operated – that’s even if someone can afford a ticket. I think the problem is that people regard driving as a right and not a privilege and many adopt bad habits soon after passing the test. Perhaps licence holders should require ongoing training with annual check tests for the under 25’s and every 5 years for the overs? Perhaps this might encourage a consistent higher level of driving standards? The revised driving test for this year, what a joke. Using sat navs, how often do you use one. most driving is done where you know, so you don’t use it when you just pop down to the shops or into town or to the cinema or going to work etc…. . Parking on the WRONG side of the road, how dangerous. The driving test is meant to be a test of your driving ability. Having control of the car and been safe, whist dealing with your surroundings. It seems to me Andrew, that because the driving test hasn’t been updated in a few years, the DVSA want to make changes just for the sake of change. Personally, I see little wrong with the current format and if anything, I think the theory should be updated with much more specific content on mobile / distracted driving and drug driving. Any update on these changes?? Was told starting May, then brought forward to April, then postponed?? Any ideas?? The changes to the 2017 driving are now detailed above. licence holders should require annual check tests for all ? Perhaps this might encourage a consistent higher level of driving standards? I have some concerns regarding two of the new manoevres, who can say that this will never happen? what if the sat nav falls off the windscreen and what if gets stuck under the drivers feet and affects the controls?, does the examiner take control? will that be a driver fault? is it driving related? also when the pupil has moved accross to the opposite side of the road and is stopped outside someones house waiting to move back accross, what if the homeowner appears and parks directly in front of the pupil blocking their view, will the examiner be comfortable for the pupil to push them into the middle of the road until the pupil can see well enough to comit? i think not! nor do i think that the examiner will help them with their observations to avoid the obvious danger. Maybe its me just being a pesimist! Should be encouraged to reverse into a parking bay and drive out forwards. It’s much safer when you can see where you are going unless you have eyes in the back of your head. Experienced and fully qualified driving instructors helping learner drivers pass the DVSA practical driving test. Will My Insurance Go Up When I Pass My Test? Can You Drive Right After Passing Your Test?